The Henley Rowing Club Junior Women’s Squad continued their season of success with a further six wins at Bedford Regatta on Saturday. Bedford attracted a competitive field to their 150th regatta, and despite a weather forecast of heavy rain showers, the sun shone on the River Ouse 1200m course through the town and added a gusting tailwind to challenge the competitors. The WJ14 squad entered coxed quads in both the first and second boat divisions and triumphed in each. 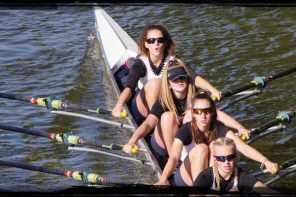 The first boat of Ruby Brown, Georgina Robinson Ranger, Lottie Orr, Issy Jonsson and Gemma Sarney as cox defeated Bedford Modern School and Kingston Grammar School in the first 2 rounds before overcoming Hinksey Sculling School in the final. The 2nd boat of Amelia Fielding Smith, Tilly Lock, Charlotte Moss, Eve Poulter and Ellie Crook secured wins over Bedford Girls School and Great Marlow School to secure victory. 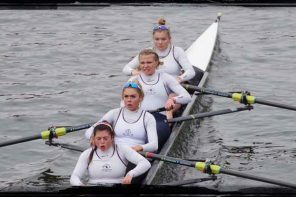 The Women’s junior coxed four of Ciara Buckley, Kryssie Steiger, Alexis Perkins, Emily Pimlott and cox Emma Lister stormed through their opening round against Kings School Chester with an emphatic win to start their campaign. Their 4 minutes and 40 seconds time in the opening heat was improved by 25 seconds in their second heat win against Bedford Girls School to take them into a final against a second Bedford Girls School crew. 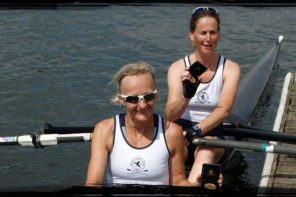 The Henley coxed four, who have commanded this boat class at races throughout the season, took an early lead in the final and held Bedford off their stern for the entire race to win by over a length. 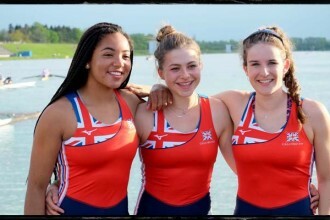 In the WJ15 coxed fours event, the Henley club entered two crews. The first boat of Ella Morgan, Georgia Edwards, Maisie Turner, Anna Roe and cox Emma Lister gained a bye in the first round and won the second round against St Edwards School easily. The final against Bedford Modern School was a closer race with some side-by-side racing for the first 500m until the Henley put down their first push of the race and accelerated away to win by nearly two lengths. The second coxed four boat of Iona McNab, Lily Stimpson, Hannah Gutteridge, Ella Wandless and cox Katie Beale won their opening heat against the second Bedford Modern School with a similar performance to their first boat counterparts. In the final, the Henley four raced Sir William Borlase School over the 1200m course to an emphatic win with an easily verdict. In the junior women’s coxed quad events, the WJ15 boat of Lauren Kay, Clare Pearson, Katy Claridge, Florence Wiggins and cox Rebecca Lister had three rounds of racing to reach the evening final. With an emphatic series of three wins through the earlier knock-out stages, the crew met an unknown entity in Oundle School in the final. The final was another demonstration of the squad’s talent as the Henley boat led from start to finish, winning in a time of 4 minutes and 11 seconds.